MASPETH, Queens (WABC) -- Despite protests, the New York Department of Homeless Services (DHS) began placing adults at the Holiday Inn Express in Maspeth. The agency rented rooms for 30 single, employed adults and hopes to convert the entire hotel into a shelter for 110 families. However, that idea has been met with backlash by the local community, public officials and the hotel itself. Critics say the shelter will be a draw for crime and drugs. "Due to local opposition to housing homeless New Yorkers, we have not been able to convert this site into a full shelter at this time. We are renting rooms for employed single adults and providing onsite services and security." 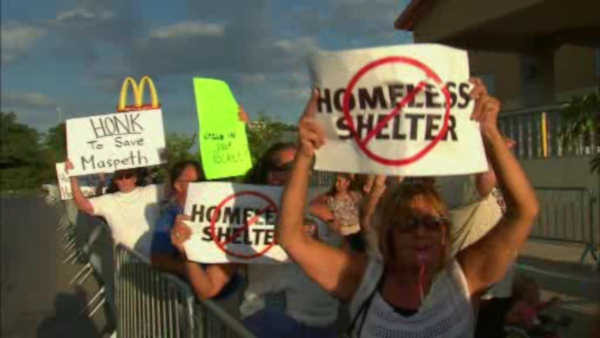 The original opening date of the shelter was set for October 1, but it was postponed after push-back from the community.